February 8, 2014 -- Last night I took a turn playing the legendary Lion's Share slot machine at the MGM Grand in Las Vegas. Not surprisingly, I didn't win the $2,343,945.26. No one has won the jackpot on the progressive jackpot slot machine in two decades, which is why devotees consider it way past due. 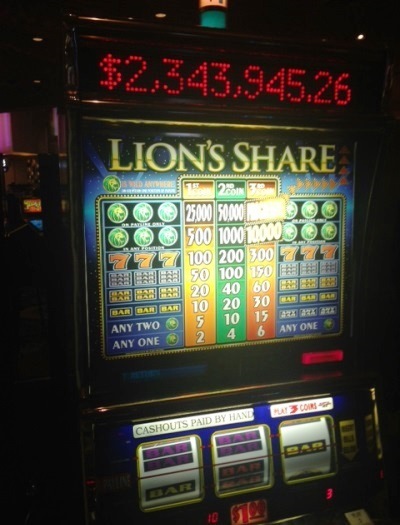 For the uninitiated, the Lion's Share is the oldest three-reel slot machine at the 5,044-room MGM Grand. It's the last of a group of nearly fifty Lion's Share slots that were installed at the hotel not long after it opened in 1993. Although the Lion's Share is aging and outdated, it's the slot with the highest level of occupancy (daily time played) of all the casino's 1,900 machines. A local bartender advised me that there are gamblers who fly in for the sole purpose of playing it, which means that its vinyl seat is often occupied for hours on end—until said player falls asleep or is out of money. So one needs to be lucky just to find the first-come, first-serve seat open—to have the opportunity to insert bills and pull the old-fashioned lever on the machine's right side. Though the Lion's Share takes $1 and $2 bets, one must wager $3 to have a chance at the $2.34 million jackpot. It's a simple proposition: One lever pull—or button push—one chance. And if you cash out, there is no ticket. You need to be paid out by an attendant, who walks over and counts out your money. One might wonder why the MGM Grand hasn't retired the machine, as it has all its leonine brothers. Fact is that gaming regulations prevent the casino from removing the Lion's Share until it pays out the lump sum jackpot. (Some say the casino hopes for a jackpot, so it can be done with the difficult-to-repair machine; others believe the MGM Grand would like the winless streak to continue indefinitely, as the Lion's Share brings in fervent devotees and curiosity seekers alike.) Similarly, no one is quite sure whether the eventual jackpot winner will have a chance to take the machine home, as some claim. Those obsessing about the Lion's Share have no shortage of opportunities to keep tabs on new developments. The machine has its own Twitter account and Facebook page, not to mention fan sites. Report: Faulty Design Caused Blowout Preventer Failure—The blowout preventer (BOP) that could have stopped the BP oil spill failed because of faulty design and a bent piece of pipe, said a testing firm in a 551-page report that appears to shift some blame away from British Petroleum.